Awhile back I won this Gals Fairy stamping plates set from a skittlette contest held by ChitChatNails. I couldn't believe I actually won a prize and was super excited to receive these. You can see my contest entry mani here. To review these plates I decided to stamp the most intricate design I could find to test pattern carving quality. The ring finger is stamped with the most intricate design. The pattern seems to be carved well, since I am able to make out fine details. I should have chosen a different type of polish for stamping to better show the quality and details. A foil polish (lots of particles) was used instead of a cream, which stamps better. However, I wanted to use a gold and only own a foil. Nonetheless, the quality of these plates still shined through my poor polish choice and beginner's stamping skills. The other fingers are just stamped with small designs that matched the complicated pattern on my ring finger. Everything stamped very well. I am totally in love with this polish combo. Base polish was China Glaze Velvet Bow and stamped with OPI I Get A Kick Out Of Gold. 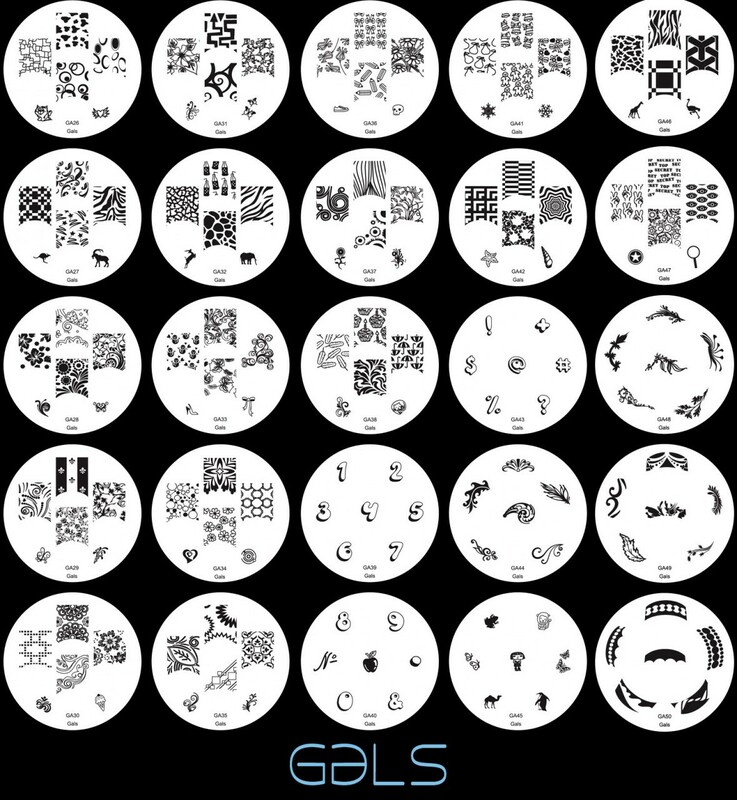 Below are close-ups of each nail and its corresponding plate pattern. Here is an image showing all the designs offered from this set. You can find these Gals plates on the Cheeky Beauty website, which sells many nail related products and great quality stamping plates. I am very pleased with the quality of these plates and love the stamping designs. A big thank you to Marta at ChitChatNails for these awesome plates!